As a graduate of the Seattle Public Schools system, and the student of so many wonderful teachers, I don’t like to think that being white made the education system a kinder, softer place for me. A Seattle Times report recently revealed that in the 2013-2014 school year, poor kids of color made up the bulk of the 69,754 suspensions and expulsions delivered across the state of Washington. They were also more likely than white students to get in trouble for certain behaviors. 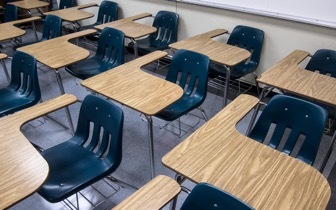 For instance, in the 2013-14 school year, of those elementary students suspended for “interference with school authority,” 56 percent were black, while 6 percent were white. Despite the good intentions of so many teachers and school policy makers, stats like these highlight the need for new approaches to school discipline. Chart from the Seattle Times. The thing to understand is about this data is that black children do not suffer disproportionate punishment because they are “worse” than white students, but because they are more likely to be punished for behavior that white children get away with (we’ll get into the “why” of this a little later). For instance, of all students classified as overtly aggressive in the 2010 study, black students were the most likely to be punished. 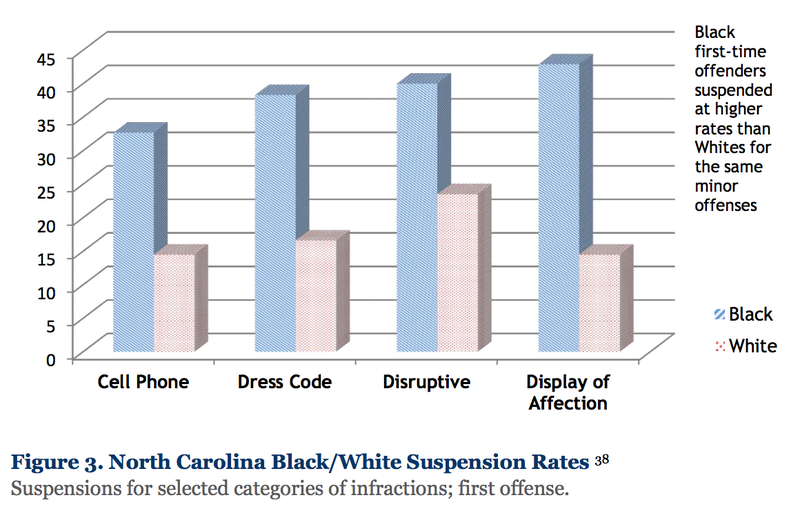 An example provided by the respected Kirwan Institute for the Study for Race and Ethnicity with Ohio State University highlights this: During the 2008-2009 school year in the state of North Carolina, black students were suspended at rates eight times higher than their white counterparts for cell phone use, and six times higher for dress code violations. For displays of affection they were suspended at 10 times the rate. That is, they get punished much more severely and frequently than white students for the same behavior. Of all first-time offenders for the following offenses, the black students received far more suspensions. Chart from National Education Policy Center. The disproportionality in discipline that black students face in Washington mirrors national data as well, and starts earlier than I suspected. According to a recent NPR story, even though black children make up only 18 percent of preschoolers nationally, they account for about half of all out-of-school suspensions. Conversely, white children make up 43 percent of preschool enrollment and receive only 26 percent of out-of-school disciplinary sanctions. But are children of color just misbehaving more? In the process of researching this piece, I read a recently published New York Times article that addressed disproportionality in discipline. It highlighted research like the fact that there are Southern school districts in which black children are suspended at rates “overwhelmingly higher” than white children. As I mentioned earlier, black children may be more likely to experience a harsher punishment than a white child for the same infraction. And, there is research highlighting that being black really does increase the likelihood for school suspension and expulsion, regardless of a child’s socioeconomic status. This last point is important, because people frequently suggest that what really is happening with the disproportionality in discipline is a problem of socioeconomic status (i.e., it has nothing to do with racism). People who endorse this perspective suggest that black kids are more likely to live in poverty, and the barriers presented by poverty cause behavior problems, which are then present in black children and youth at relatively higher rates. It is true that sustained poverty and stress can cause issues for children at school, which I’ve outlined in other blog posts. Low-income kids are more likely to run into school disciplinary procedures. However, researchers have addressed this argument as it relates to black youth and found that discipline is often because of race. Above and beyond poverty, race significantly predicts that black children will be over-represented among students who are suspended. 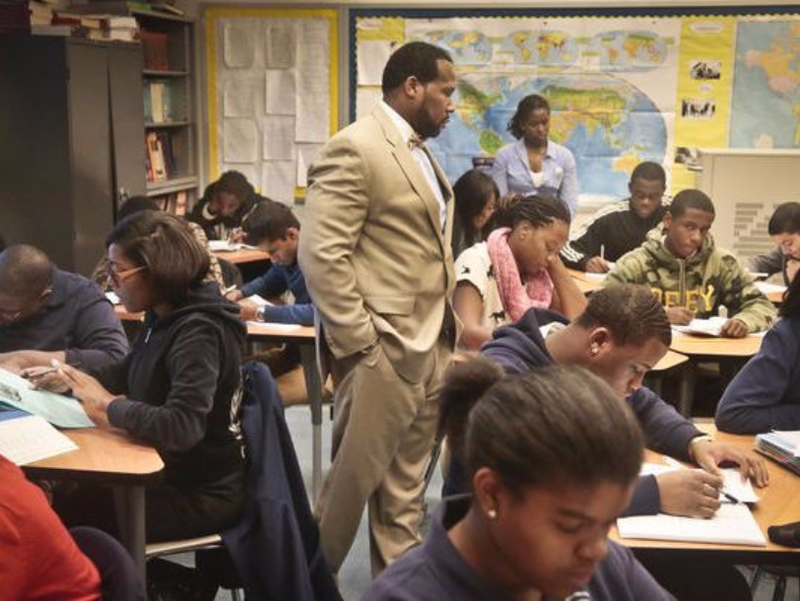 Across all socio-demographic levels, black students are more likely to be suspended. Black students do not engage in more severe behavior than other students (which would warrant the use of procedures like suspensions). Schools with a higher percentage of black students are more likely to use zero-tolerance policies – or inflexible punishment regardless of extenuating circumstances — and aggressive disciplinary procedures than those with fewer black students. Schools with diverse faculty members are less likely to have a disproportionality problem, which is good news — except on average across the United States, 83 percent of teachers are white. “The fact that race remains a significant predictor of discipline after controlling for a range of disciplinary infractions strongly suggests that factors related to student behavior are not sufficient to account for racial/ethnic disparities in discipline,” researchers at Ohio State University concluded. Teachers have tough jobs; they are expected to work long hours, underpaid and without the level of support that could make a real difference in their classrooms. Therefore, if we want to support kids of all races, we need to support teachers. This could help keep kids in class. Image from PBS. However, what these facts leave unanswered is why this disparity happens. To help answer the question as to why students of color, and black and Hispanic students in particular, are more likely to be suspended or expelled, researchers at Stanford University designed two experiments with the purpose of generating insight into the racial discipline gap. What they found is that a student’s race influences how their teacher interprets their behavior. The researchers were able to determine this by giving actual teachers two different versions of student records of misbehavior. These two different records were exactly the same except for one thing: the names on the records. In some cases, the name was a stereotypically black name, in others a stereotypically white name. The first experiment asked teachers to rate the behavior contained in the case files along dimensions of severity, how annoyed it would make them, their thoughts on what an appropriate punishment would be, and whether they thought the student was a problem in the classroom. In the second experiment, teachers were asked if they saw a pattern in the behavior, and if suspension would be appropriate. What both experiments revealed is that teacher perception of child behavior was influenced after they reviewed the second infraction (so not for the first one), and that racial stereotypes explained this relationship. Essentially, teachers were more concerned about the student’s second instance of misbehavior if he/she were black than white. They also were more likely to recommend a harsh disciplinary sentence, including suspension, for the student with a black-sounding name. The teachers differed in their perceptions of student behavior because of stereotypes about black students as problems, a view that these teachers may not even know they had. Which brings me to implicit bias, and the role that stereotypes and unconscious thought processes play in shaping how we view people and behavior. There is no such thing as being color blind–all of us, of all backgrounds, notice race (and gender, and sexual orientation etc. 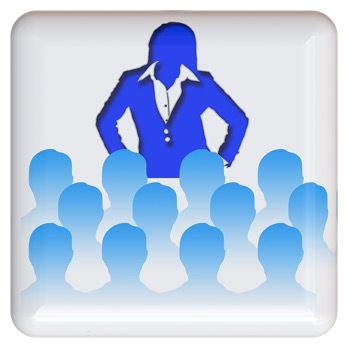 ), and make inferences about people based on these qualities. The goal is to always work toward ensuring these inferences are as non-biased as possible. Image from pixabay.com. 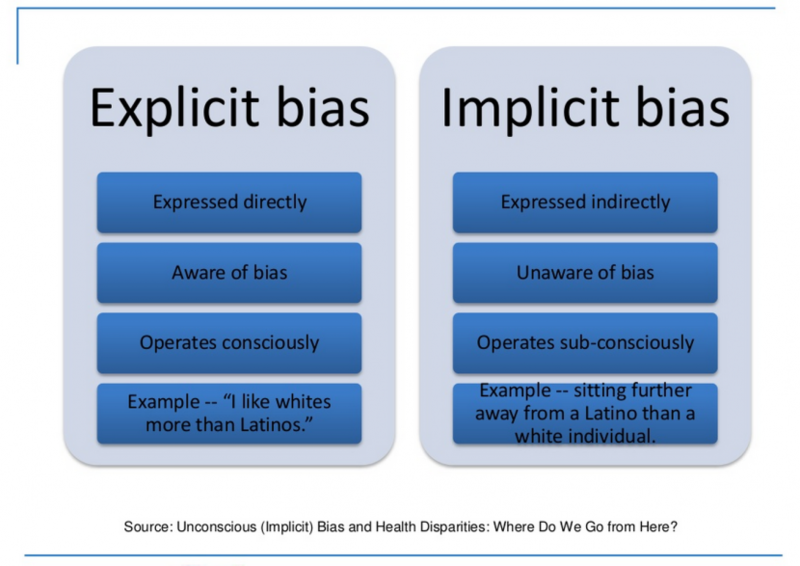 Both implicit and explicit bias shape differences in opportunity for different groups of people. Image from Center for Social Inclusion. Importantly, people who hold egalitarian beliefs and who are not explicitly prejudiced against a specific group of people may still hold implicitly prejudiced beliefs. That is, you can believe in equality, yet still unintentionally engage in behaviors which would indicate otherwise. It’s the kind of bias that is easy to minimize or deny. It can result in microaggressions — like when a person of color is thought to be a service worker, or a black man has a tough time getting a cab, but a white man is easily picked up. Or, when a woman or person of color is asked to speak for the entirety of their race or gender. Thus, microaggressions can range from the relatively subtle to the more overt. Further, in case I didn’t make this clear, implicit bias is not just about racism, but impacts all marginalized groups in our society. Implicit bias and stereotypes around class exist as well, such that people may believe the poor are lazy, or poor parents don’t care about their child’s education. Implicit racism and microaggressions are common experiences for minority groups across our country, and the education system is no different. The presence of implicit racism (and even, I am sure, explicit racism) causes black and Hispanic children to be expelled at rates higher than white students. However, what makes this reality troubling is not just that it happens, but that it can dramatically increase the likelihood that a child will drop out of school, fail to graduate, and end up in the prison system. This relationship, between implicit racism, suspension, expulsion, and the prison system has been enshrined in the now infamous “school-to-prison pipeline,” an eerily accurate phrase for the intimacy that exists between school discipline and a jail cell. In Part Two, coming out later this week, I’ll look at examples of the school-to-prison pipeline, troubling statistics on the re-segregation of American schools, the benefits of integration and how some schools are re-thinking discipline through the lens of trauma.